Vintage West Woodland – Seattle | Sharing stories of the West Woodland Neighborhood located in Seattle, WA. Explore the headquarters of this automotive empire and meet legendary race car driver Al Young. Full details below, courtesy Atlas Obscura. 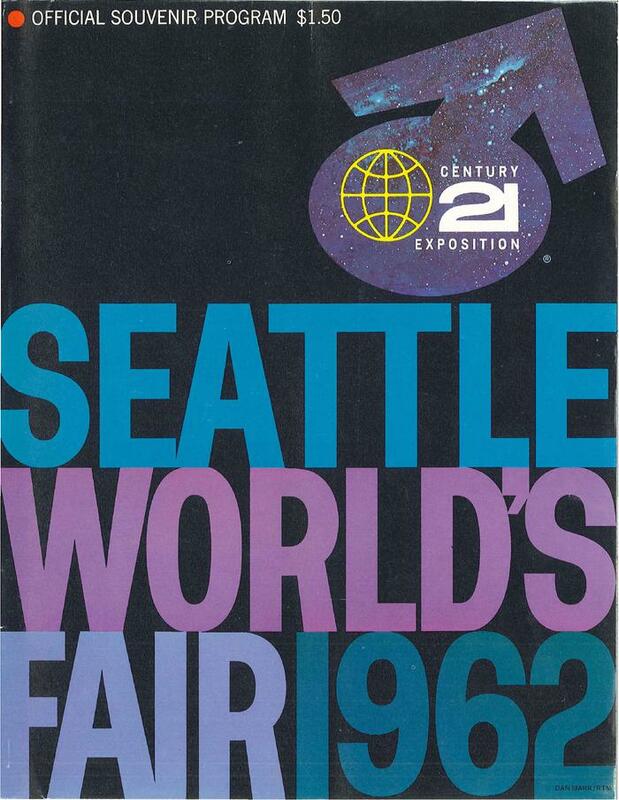 Do you remember the Seattle World’s Fair? If so, Jeanne Kohl-Welles, King County Councilmember – District 4, wants to hear from you! Her team is working on a project and they would appreciate having interested individuals interviewed on camera to recollect old times around the working title, “The 1962 World’s Fair — What Did the Neighbors Think? 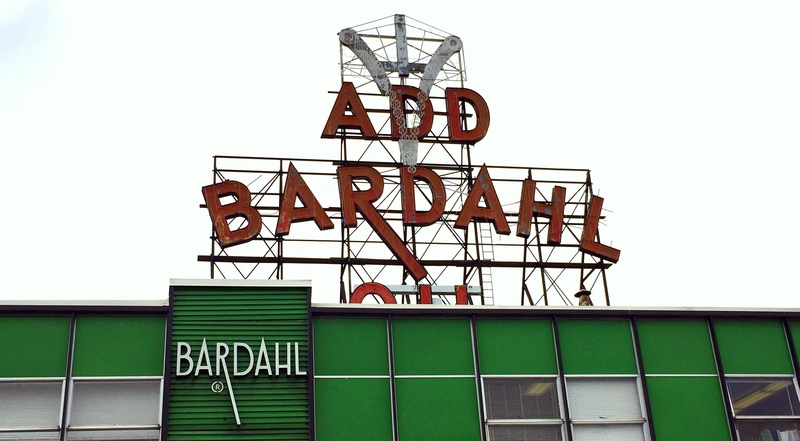 ?” There are fantastic productions around the major players and the bigger picture, but none around how the Fair impacted the lives of those closest to it—residents in and around District 4, which includes Ballard. Space and time for this project are limited, so if you have stories to share, they are excited to hear them! The interview will be taped in the KCTV studio at the King County Courthouse in Pioneer Square. Please contact Kohl-Welles’ Chief of Staff, Adam Cooper, at adam.cooper@kingcounty.gov or 206.477.3763 to get involved in this exciting and fun effort. When the final product is complete, the project will be posted so you can all see and hear our neighbors’ views of this critical part of County history. World’s Fair Souvenir Program, shown above, courtesy Seattle Municipal Archives, IDENTIFIER: 435_014. 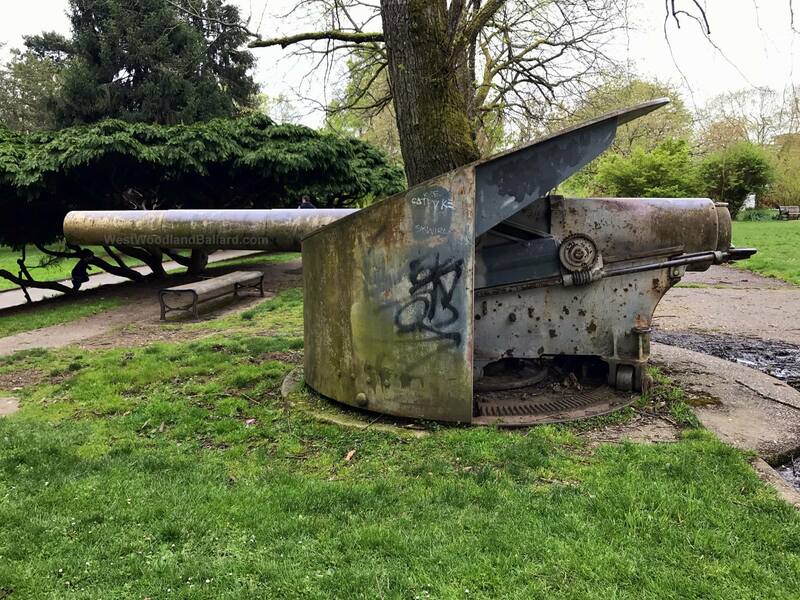 Located at the corner of North 50th Street and Phinney Ave North, War Garden Park is losing its cannons. 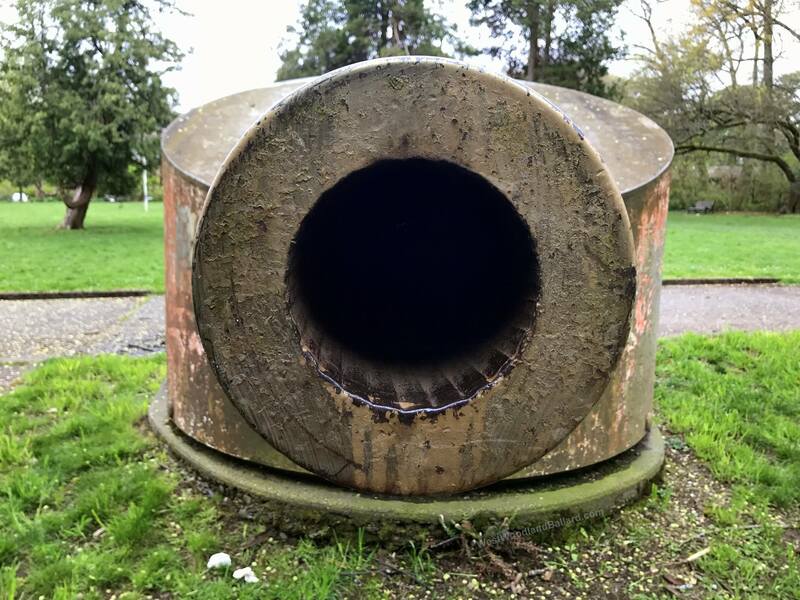 The Seattle Department of Recreation put out a notice that the two cannons from the U.S.S. 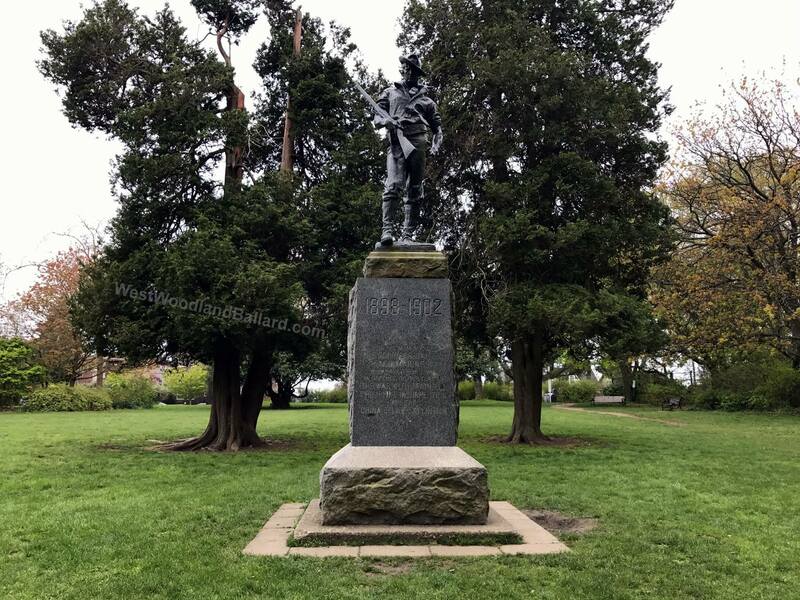 Concord commemorating veterans of the Spanish-American War would be removed. You can read the full notice HERE, and a screenshot has been provided below. Here are pictures of one of the guns that will be removed. Dated, April 29, 2017. History of the park as detailed by the Woodland Park Zoo is available online at http://www.zoo.org/about/chronologicalhistory and below. 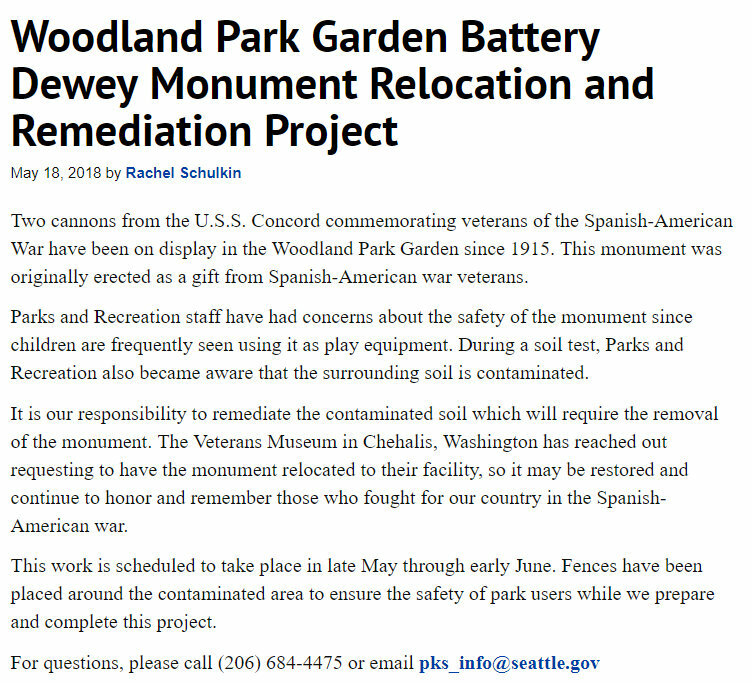 1914: On January 23rd, the southwest corner of WPZ, later known as the War Garden, was dedicated to the veterans of the Spanish-American War. Two Civil War-era barge howitzers (small wheeled field pieces) were added to the existing naval guns that had been placed there in 1911. 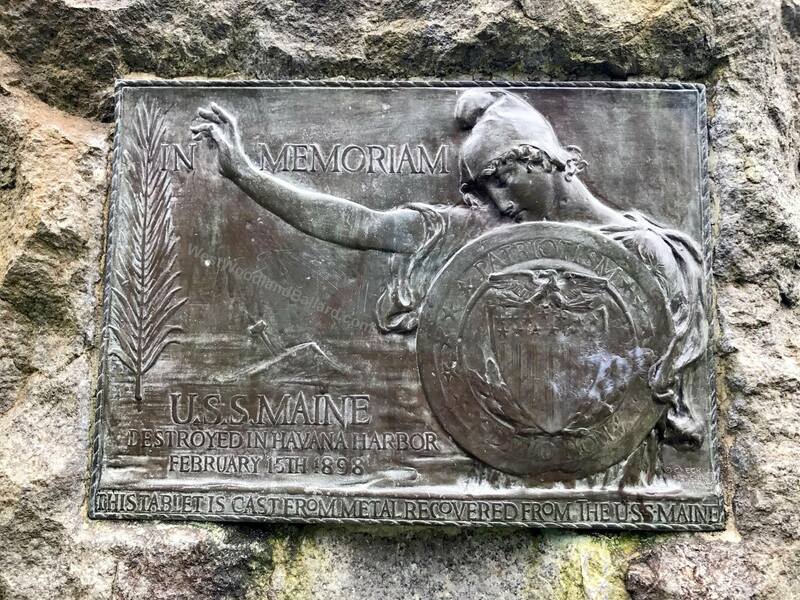 A plaque made of metal from the USS Maine was set there as well, to honor the personnel of the USS Illinois. It is not clear why the Illinois was specifically honored. 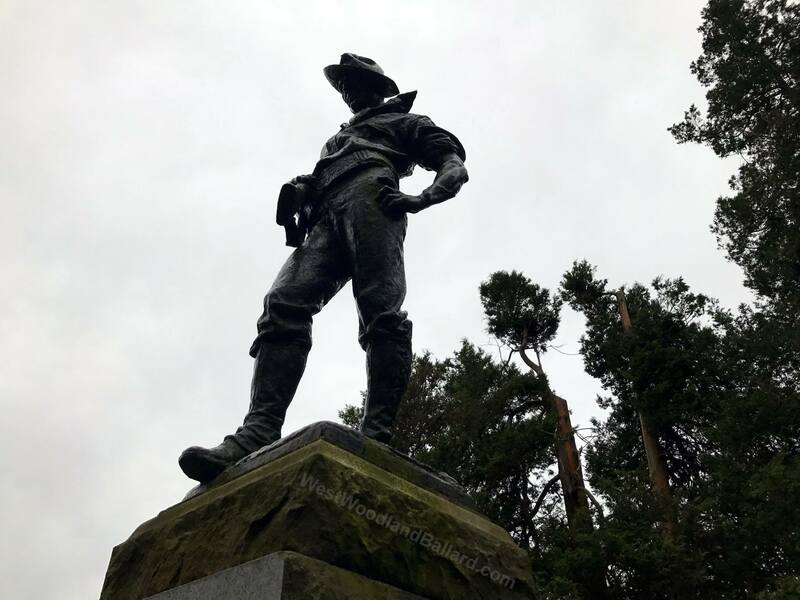 Learn more about Seattle’s connection to the Spanish-American War from HistoryLink.org. 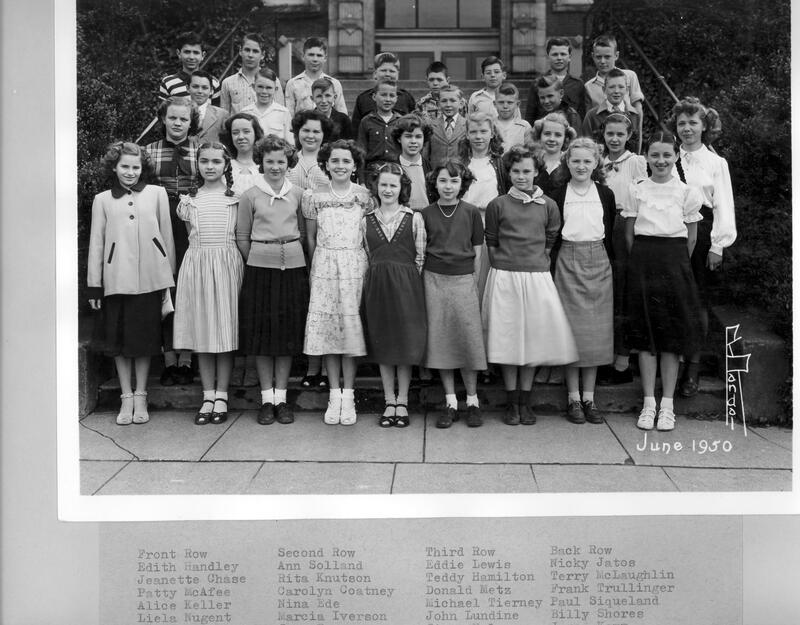 Photo #1: West Woodland School, 7th Grade Class, June 1950. 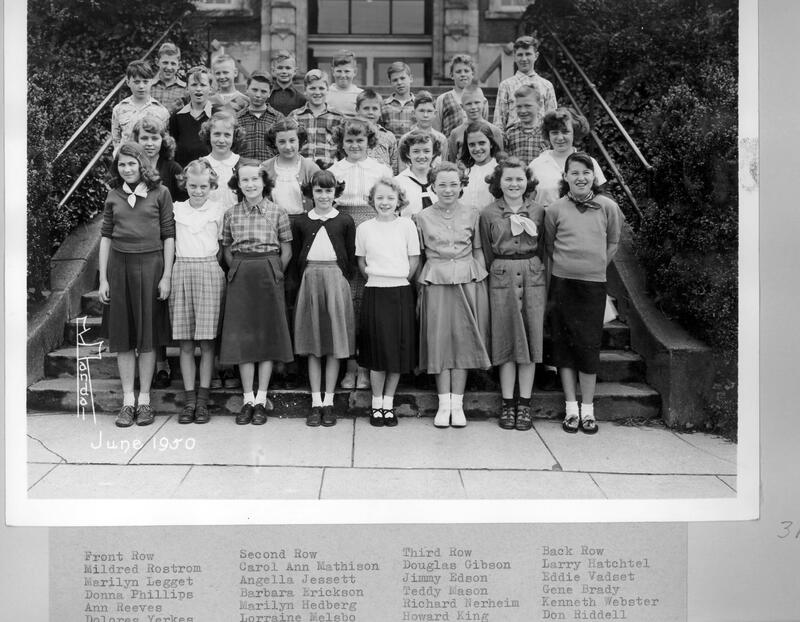 Several years ago, I reached out to Seattle Public Schools asking about old school photos. I was hoping they would have a storage room full of dusty boxes containing old class photos and pictures of events that had long been forgotten. Maybe they would let me dig through them and scan a few to share online. I was excited to find out that not only did they have photos, the school district also had a dedicated archives department. Score one for historic preservation! Through email I was introduced to Aaren Purcell, who works in the archive department scanning and cataloging these treasures. The photos are a genuine joy to look at, and occasionally the district will post to their Facebook page. Purcell was so kind to share a few school photos, which I have posted below. 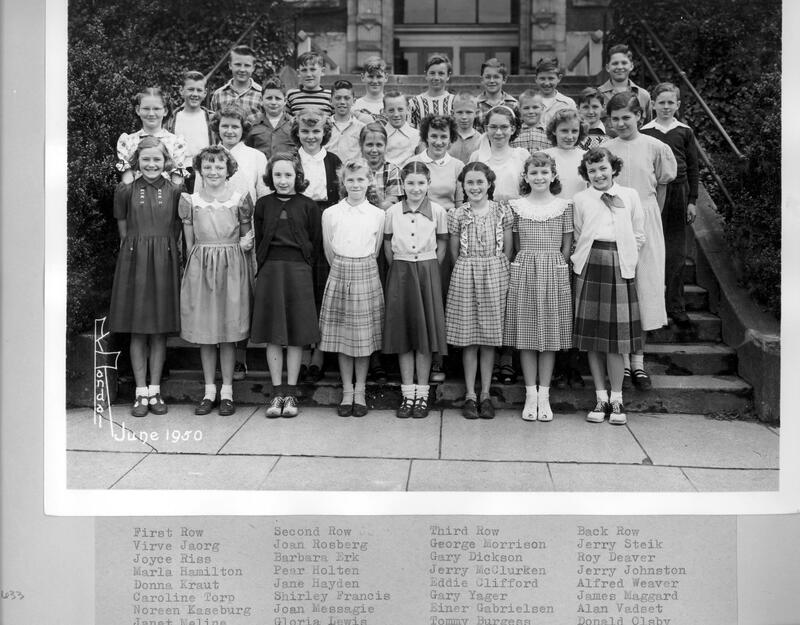 Most of the photos include some student names, but the scanner face isn’t large enough to include the whole document and some of the names have been cut off. If you recognize a classmate, brother, sister, or neighbor, please comment below and include the photo number and a general description of where they are standing. You can also email westwoodlandneighbors@gmail.com. Let’s talk about the 7th Grade photo at the top of this page. 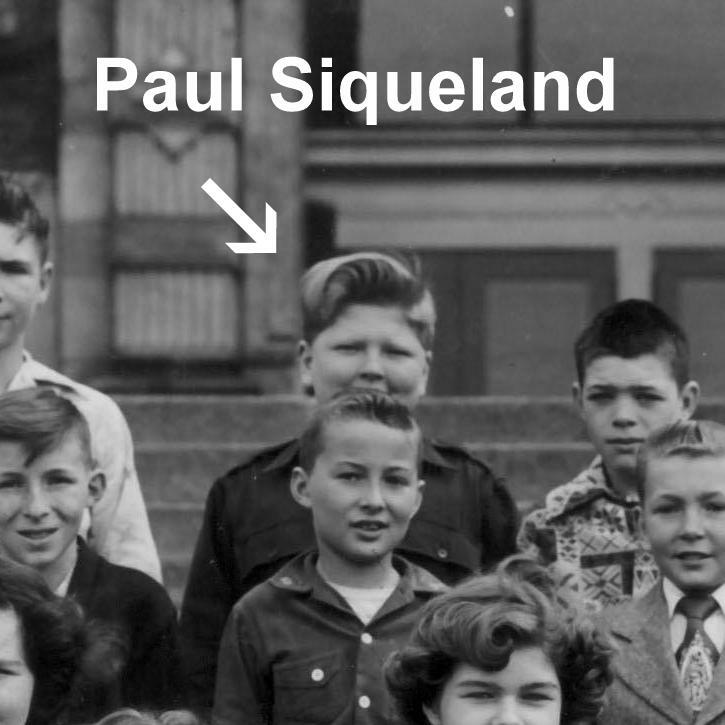 I first shared this photo on Facebook and, as a result, was contacted by the daughter of one of the children pictured, Paul Siqueland. Turns out that Paul once lived in my home. His parents bought this little Ballard brick after years of Lutheran missionary work in Asia. Another daughter of Paul’s came by the house and shared many happy memories of her time spent playing in the yard. She was pleasantly surprised to find out we hadn’t remodeled, and the house looked pretty much like it did during her childhood. The pink kitchen paint has long been covered, but all the burgundy tile is still intact. Her Grandmother would be happy. 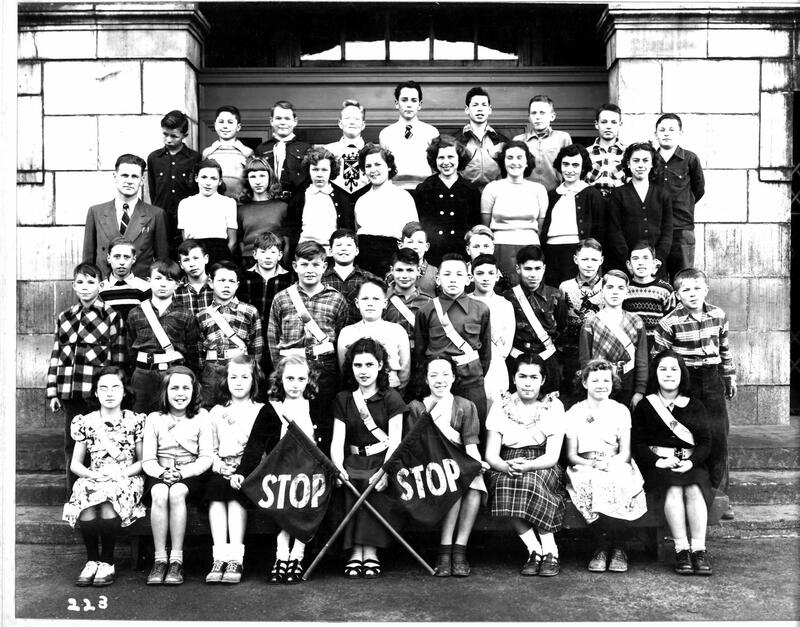 Here are a few more school photos, courtesy Seattle Public Schools. Do you recognize anyone pictured? Let us know! Comment below, or email westwoodlandneighbors@gmail.com. Ballard Historical Society plans to Heart Bomb Hattie’s Hat, the oldest continuously running Ballard Restaurant, on February 14 at 8:00 AM and you’re invited! Heart Bombing is a form of advocacy, a fun and creative way to bring people together and raise awareness about what’s cherished in a community — places both safe and threatened — with homemade valentines that serve as a sort of love letter to places that matter. This February, groups and individuals across the country will be heart bombing the places that matter to them. Heart Bomb with the Ballard Historical Society! To join in, craft up a valentine and join your neighbors at Hattie’s Hat, 5231 Ballard Ave NW in Old Ballard, at 8:00 AM on February 14. 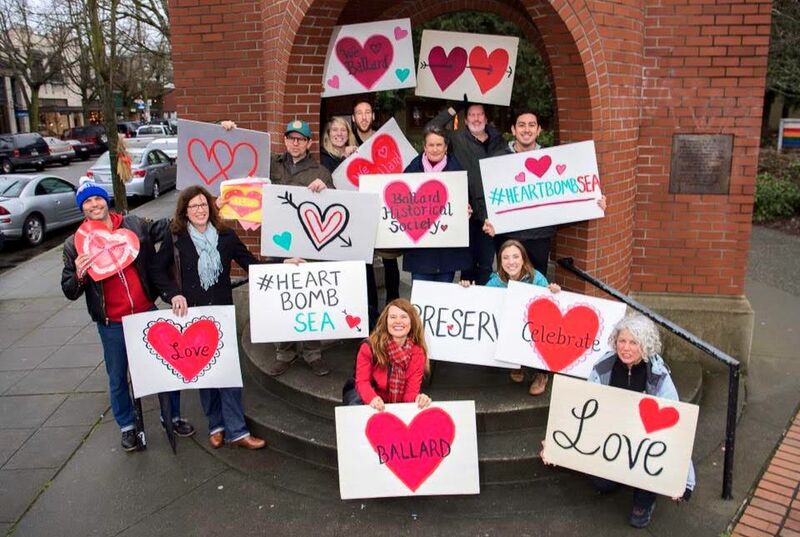 They’ll snap a picture, and share on social media using #HeartBombSEA and #IHeartSavingPlaces to be part of the local and nationwide love fest! Not crafty? No worries! Ballard Historical Society will have ready-made Valentines for you to use, if you’d like. While the actual month this photo was taken is unknown, I believe it may have been taken in June or July of 1937. During the 1930s the West Woodland Commercial Club would host a neighborhood event called “Klondike Days”. This two day event would include a parade, with floats and marching bands, as well as games of chance, live music and dancing. The streets would be dressed with decorations, including banners and streamers, which can be clearly seen in this photo. More on “Klondike Days” in a later post. In 1937, 618 NW 65th Street was home to the West Woodland Pharmacy (today soon-to-open JOLI SEATTLE). 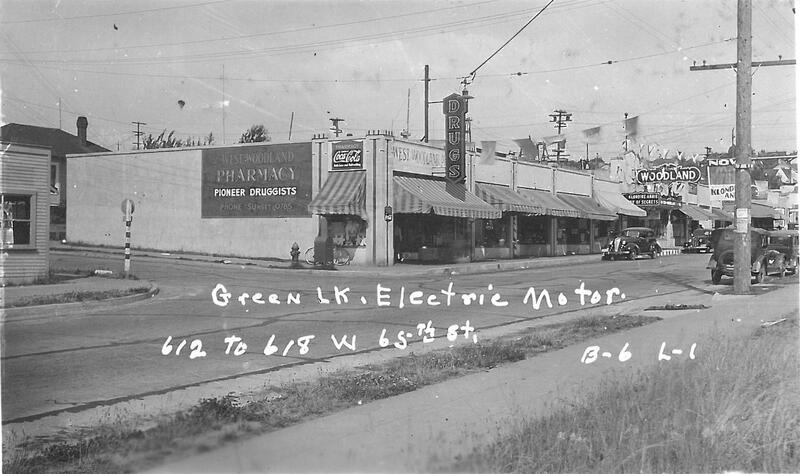 Directly east of the pharmacy was Hansen’s Barber Shop at 616 NW 65th Street (today BaBaLouise Salon). West Woodland Dry Goods, at 612 NW 65th Street, shared their double store front with the US Post Office (today The Sneakery). You can also see the Woodland Tavern (today Molly Maguires) and the Woodland Theater’s marque in this picture (today Advance Sign Design, Jigsaw Records & the new Woodland Theater performance space). The movie playing that day at the Woodland Theater was “Klondike Annie” staring Mae West. This retail space was built in 1926 and has remained largely intact. There have been changes to the exterior facade, as well as window and door placement, but the footprint of the building remains the same. The black & white photo, courtesy the Puget Sound Archives, shows the NE corner of 7th Ave NW & NW 65th in 1937. This year at 8am on Valentine’s Day, we’d like to stand in front of the Sunset Hill CC (3003 NW 66th St, Seattle, WA 98117) to snap our photo! We hope you will join us for a quick pic! We have about 10 signs already created, but we’d love if you wanted to bring your own valentines as well.